The Faculty of Education traces its beginnings back to 1857 when the McGill Normal School was established at McGill by agreement between the University and the Government of Quebec. In 1907, it was re-named the School for Teachers and was moved to Ste. Anne de Bellevue where it became part of Macdonald College. At this time also, the Macdonald Chair of Education was endowed at McGill University and a Department of Education was created in the Faculty of Arts and Science for the purpose of preparing candidates for the High School Diploma. In 1955 the School for Teachers and the Department of Education were combined to become, within the Faculty of Arts and Science, the Institute of Education. To these was joined, in 1957, the McGill School of Physical Education (founded in 1912). 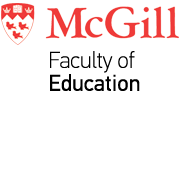 In 1965, the Institute was reconstituted as the Faculty of Education and the work continued both on the McGill and the Macdonald campus. In 1970, the St. Joseph Teachers College and the Faculty of Education were amalgamated and relocated in a new building on the McGill Campus. Currently, the Faculty has over 2,800 students, of whom about 900 are graduate students enrolled in programs of the Faculty of Graduate Studies and Research, 1,500 are in full-time programs of initial teacher education and 480 are registered in part-time programs of professional development. The Faculty is organized into three academic units and, in addition, has a number of research and service centres of an interdisciplinary nature. In recent years a number of links have been established with counterparts in other countries for teaching, research and development purposes. Current active projects, some of which involve students as well as staff, include those in Japan, Indonesia, South Africa and the People's Republic of China. In 2007 the Faculty commemorated 150 years of teacher education with year long celebrations culminating in an open house exhibition and gala dinner. Alumni, students, faculty, staff and friends came together to share in this special occasion.